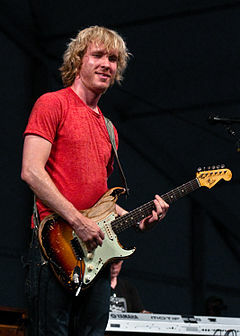 Kenny Wayne Shepherd (born Kenny Wayne Brobst; June 12, 1977) is an American guitarist, singer, and songwriter. He has released several studio albums and experienced significant commercial success as a blues artist. Stephen Stills and Shepherd (front) and Barry Goldberg, not visible, performing as The Rides in Boston, Sept. 7, 2013. Shepherd was born in Shreveport, Louisiana. He graduated from Caddo Magnet High School in Shreveport. He is "completely self-taught",  and does not read music. Growing up, Shepherd's father (Ken Shepherd) was a local radio personality and some-time concert promoter, and had a vast collection of music. Shepherd received his first "guitar" at the age of three or four, when his grandmother purchased a series of several plastic guitars for him with S&H Green Stamps, which Shepherd has said he would "go through like candy". Shepherd stated in a 2011 interview that he began playing guitar in earnest at age seven, about six months after meeting and being "pretty mesmerized" by Stevie Ray Vaughan, Labor Day weekend in 1984, at one of his father's promoted concerts. His self-taught method employed a process of learning one note at a time, playing and rewinding cassette tapes, using "a cheap Yamaha wanna-be Stratocaster...made out of plywood, basically", and learning to play by following along with material from his father's record collection. Blues musician Bryan Lee invited 13 year old Shepherd to play guitar onstage. He subsequently made demo tapes, and a video was shot at Shepherd's first performance at the Red River Revel Arts Festival in Shreveport. It was this video performance that impressed Giant Records chief Irving Azoff enough to sign Shepherd to a multiple album record deal. From 1995 on, Shepherd took seven singles into the Top 10, and holds the record for the longest-running album on the Billboard Blues Charts with Trouble Is.... In 1996, Shepherd began a longtime collaboration with vocalist Noah Hunt, who provided the vocals for Shepherd's signature song, "Blue on Black". Shepherd has been nominated for five Grammy Awards, and has received two Billboard Music Awards, two Blues Music Awards, and two Orville H. Gibson Awards. In 2000, Shepherd played guitar on the end title theme for the animated feature Batman Beyond: Return of the Joker. In September 2008, Fender Musical Instruments Corp. released the Kenny Wayne Shepherd Signature Series Stratocaster, designed exclusively by Shepherd. In 2007, he released a critically acclaimed and two time Grammy nominated DVD–CD project, 10 Days Out: Blues from the Backroads. This documents Shepherd as he travels the country to jam with and interview the last of the authentic blues musicians. As they tour the backroads, Shepherd, with members of the Double Trouble Band, play with a host of blues greats including Clarence "Gatemouth" Brown and Bryan Lee, Buddy Flett (with whom he jams at Lead Belly's grave), B. B. King, blues harp master Jerry "Boogie" McCain, Cootie Stark, Neal Pattman, John Dee Holeman, Etta Baker, Henry Townsend with Honeyboy Edwards, and a concert session with the surviving members of Muddy Waters' and Howlin' Wolf's bands, including luminaries such as Hubert Sumlin, Willie "Big Eyes" Smith, and Pinetop Perkins. In 2010 Shepherd was nominated for a Grammy for Live In Chicago which featured performances with Hubert Sumlin, Willie "Big Eyes" Smith, Buddy Flett and Bryan Lee. In 2011, Shepherd released his seventh CD entitled How I Go on Roadrunner Records. In 2014 he released "Goin Home" on Mascot Label Group in Europe and on Concord Records in the US and the rest of the world. In 2015 Shepherd released "Something From the Road Vol. 1," a live special release for Record Store Day in the U.S. In January 2017 the Kenny Wayne Shepherd Band went into the studio with producer Marshall Altman to record a new album of all newly written songs titled Lay It On Down and released the album on August 4 (July 21 in Europe on Mascot Label Group). Lay It On Down is the eighth record by the Kenny Wayne Shepherd Band to debut at No. 1 on the Billboard Blues Chart. In 2013, Shepherd, along with Stephen Stills (Crosby, Stills & Nash) and Barry Goldberg (Electric Flag), formed The Rides. The three wrote, recorded, and released a CD entitled "Can't Get Enough" on August 27, 2013. Stills refers to the band as "the blues band of my dreams". The band toured the US in 2013 supporting their debut record, culminating with an appearance on The Tonight Show with Jay Leno. The three reunited in 2015, writing and recording a second release, "Pierced Arrow" that was released on 429 Records and Mascot Label Group in Europe in 2016. Shepherd married Hannah Gibson, the oldest daughter of actor Mel Gibson, on September 16, 2006. The couple has five children: three daughters and two sons. Kenny Wayne Shepherd Band played opening act for Van Halen on their 1998 tour and again on their Van Halen 2015 North American Tour. Shepherd undertook a double-headliner tour in Summer 2015 with Jonny Lang. Shepherd made a trip of ten days in the U.S. to meet and play with his idols: B.B. King, Clarence "Gatemouth" Brown, Hubert Sumlin, Pinetop Perkins, Henry Townsend, Honeyboy Edwards, Cootie Stark, Neal Pattman, Etta Baker, Jerry "Boogie" McCain, Buddy Flett, Bryan Lee, John Dee Holeman, and the Howlin' Wolf and Muddy Waters Bands. This effort would later become his fifth album, 10 Days Out: Blues From the Backroads. Shepherd and Bryan Lee appeared as the musical guest on The Tonight Show with Jay Leno on February 14, 2007. On July 24, 2007, he opened for Lynyrd Skynyrd at the Orange County Fair. He was the opening act for The Rolling Stones during a stint of their 1999 No Security tour. Shepherd performed some of his songs including a cover of Jimi Hendrix's "Voodoo Child" at the Dutch Mason Blues Festival in 2007 and 2009. He has also opened for Aerosmith, Bob Dylan, the Eagles (originally on the Hell Freezes Over Tour), and Van Halen. Late Night with Jimmy Fallon performance, Nov 2010 - Shepherd sat in with house band, playing the actual white Stratocaster Jimi Hendrix used during his historic performance at Woodstock. On January 15, 2011, Shepherd performed a live set for "Guitar Center Sessions" on DirecTV. The episode included an interview with Shepherd by program host, Nic Harcourt. Shepherd appeared at the Experience Hendrix tribute concert in Mesa Arizona on May 23, 2011. Shepherd opened for BB King in Atlanta's Chastain Park Amphitheater July 4, 1999. ^ "Concord Records - Concord Music Group". Concordmusicgroup.com. Retrieved 23 January 2018. ^ "Kenny Wayne Shepherd Band Premiere New Song, "Baby Got Gone"". Guitarworld.com. Retrieved 23 January 2018. ^ Biography for Kenny Wayne Shepherd on IMDb Retrieved January 2008. ^ a b c d e f Harcourt, Nic (host) (February 12, 2011) [Recorded January 15, 2011]. "Kenny Wayne Shepherd". Guitar Center Sessions. DirecTV. ^ "Mel Walks His Daughter Down the Aisle". TMZ.com. Retrieved 2011-12-31. ^ a b c d e f g Kenny Wayne Shepherd awards at AllMusic Retrieved 2012-08-31. ^ "Discography Kenny Wayne Shepherd". charts.org.nz. Hung Medien. Retrieved 2011-07-07. ^ "Discography Kenny Wayne Shepherd". swedishcharts.com. Hung Medien. Retrieved 2011-07-07. ^ "Discography Kenny Wayne Shepherd". swisscharts.com. Hung Medien. Retrieved 2012-08-31. ^ Zywietz, Tobias. "Chart Log UK – Update 13.08.2011". Zobbel. Retrieved 2011-08-12. ^ "kenny-wayne-shepherd-band - full Official Chart History - Official Charts Company". Officialcharts.com. Retrieved 5 August 2017. ^ a b c d "RIAA certifications". Recording Industry Association of America. Archived from the original on 2007-06-26. Retrieved 2011-07-07. ^ "Top 200 Albums". Billboard.com. Retrieved 17 August 2017. Wikimedia Commons has media related to Kenny Wayne Shepherd.